Local education workers and labour supporters are sending a message of “solidarity” in response to the Liberal government’s “bullying” at the bargaining table. Members of the Ontario Secondary School Teachers’ Federation and other labour supporters turned up with flags and signs outside of the public school board headquarters in Windsor on Friday afternoon, to protest Education Minister Liz Sandals’ move to allow pay cuts of up to 10% for education workers. Hradowy addressed about 100 supporters at the rally. OSSTF President Paul Elliott has said the union has no plans to withdraw its current job action and warned the action would escalate if wages were cut. He also called on the province to return to the bargaining table. 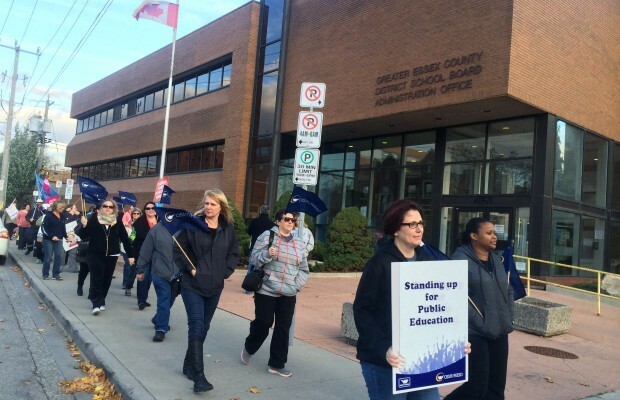 Support staff represented by OSSTF are the only local group still without a deal at the provincial level of the new two-tiered bargaining process as all other unions either have tentative or ratified agreements.